The local squash has been so delicious this season!! Place the sliced squash on a greased pan or parchment lined pan. Be sure the inner pulp of the veggie faces up. Drizzle the slices with honey and a pinch of CLOVES GONE WILD sea salt to taste. Roast at 375 degrees for about 35-40 minutes or until the squash is tender. This may differ according to the size of the slices. 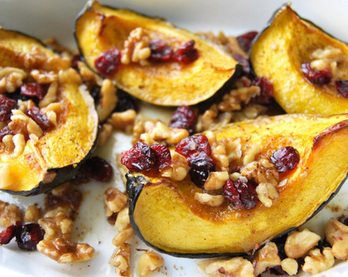 Once the squash is tender and finished roasting, toss cranberries and walnuts over each slice, re-drizzle with more honey and refinish with CLOVES GONE WILD to taste! Try it tonight - so yummy!